Overview of Halong Bay Experience Local Life Along Mekong River Mekong River Cruise in Asia - HOT TREND There is no doubt that the Vietnam is brimming with beautiful, charming places. Large cities like Hanoi or in Saigon offer a great deal to a person wanting to experience today’s Vietnam. But if you are wanting to strip away the cars and scooters, high rise apartments or fast food restaurants and experience something more authentic, exit these major cities and visit one of many picturesque Vietnamese villages that are filled with old-world charm and tranquil beauty. Is this some what modern travelers are searching for? We've made a list of some of 5 favorite small villages that you should plan to spend some time in or take a few days. Away from the bustle of big city life, each has a unique charm and atmosphere. Located 45 km west of the center of Hanoi, Duong Lam is the finest example of typical northern ancient Vietnamese villages. You can get there by renting a car with driver from your hotel (around 80 dollars US or so for the day). 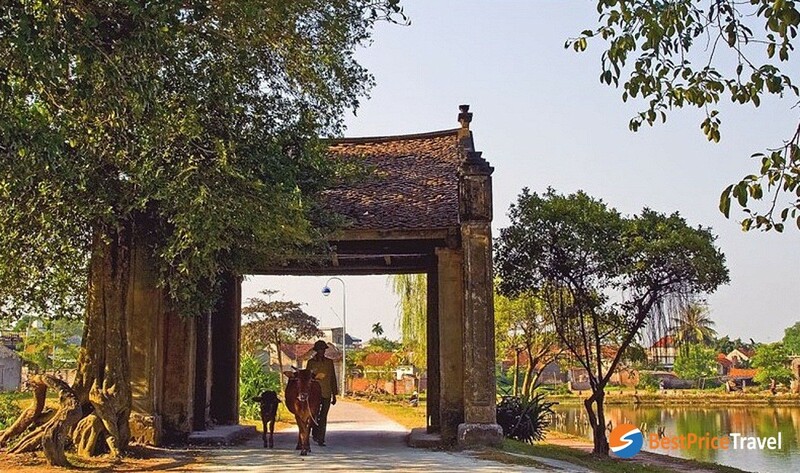 Undertaking thousands years of history, the village still possesses its original structure with banyan tree, water well, communal house, endless rice fields... Duong Lam is a good place to learn about Vietnamese history and culture. This is the birthplace of two national heroes: King Ngo Quyen and King Phung Hung. It's a very atmospheric place to walk around, and villagers (many of whom appear to be octogenarians) are particularly friendly and keen to chat. Ban Pom Coong (Pom Coong Village) is a small village in Mai Chau town (4-hour drive from Hanoi). The village is tucked away in the mountains of northern Vietnam and is inhabited mostly by Thai people. The village is an ideal haven from the pressure of life with its lush landscape and relaxing atmosphere. The community still lives in a ‘pure Thai’ space. Recently, many villagers open up their homes for homestays and sell handicrafts for souvenirs, gorgeous embroidered bags and brocade products in bright colors while others help entertain tourists by traditional music performances or serving regional specialties like sticky rice cooked in bamboo cylinders, "man" pig (a small breed that we can carry in our arm), can liquor (wine drunk out of a jar through pipes). Visiting Pom Coong Village, tourists also have a chance to stay on stilt houses with local host family, enjoy home made meals with them and immerse in traditional culture by joining traditional song and dance performances with friendly ethnic people. Here, artisan booths offer chock full of handicraft items for sale: handmade scarves, purses, coin pouches, and other textile goods... You can buy lovely one without having to haggle on price. Purchasing souvenirs is a good way to support the local community, you know. While staying in Vietnam you can see many different kind of lifestyles. One of these impressive lifestyles is living on a floating house. There are some floating villages in Halong Bay where communities of fishermen make their living, not near the bay or on any island but on their boats and rafts of bamboo and styrofoam to float. Among them, Vung Vieng belongs to Bai Tu Long Bay in a less touristy area. To get to the village, you can book one of numerous cruise tours that allow you sailing through the magical bay. Halong Bay is famous for its many thousands of limestone karsts and these form the backdrop for the village. Between the imposing and steep limestone mountains, you’ll find clusters of floating houses which become a floating village. Traditionally, villagers earn their money from the ocean. They catch fish and sell it. Living in the middle of ocean, if they need anything, they have to go to Cat Ba town or to the mainland. Touring the village, you have an opportunity to meet locals and see what it is like to live daily life. When you look at the floating village with their small houses, big enough for a family to sleep in, you wonder how they survive. Imagine, you don’t have running water, no electricity only a generator and well... you’re living on the water. Lat Village is located at the foot of Langbiang Mountain, about 16km outside Da Lat city center. It's also known as the Chicken Village. Coming here, you'll see a giant chicken statue in the center of the village and there is a story behind it. A visit to this village is truly an eye-opening look into the simple life of the tribes live here. The Lat , Chill, Ma and K'ho people, they are among some of the poorest of Vietnam's indigenous minority peoples. Their main income is, as it always has been, derived from farming. They also practise traditional silk weaving and textiling. The villagers are very poor. You can help the comunity by purchasing some handmade items. There are beautifully soft scarves waiting in stalls ready to be sold. If you don't want to buy something, bring some school supplies for children. Pens, pencils, crayons or notebooks are the perfect gift. Sometimes it's worth going far off the beaten track, so rather than sticking to the big-name attractions, head out and discover an adorable little village. Being home to a tranquility you won't often find in large cities, small villages where local residents still running cottage industries like rice wine brewing, rice paper production or hand weaving of sleeping mats offer a completely different experience and another insight into a culture. Of course, this is only a very small selection of villages that you will find scattered across Vietnam. They may be tiny, but have plenty of character. That said, each can be fit into a day, so don’t doubt taking a day out to visit one of these beautiful villages in Vietnam!